I’ve tried to make the concept less abstract by offering a specific metric for determining product/market fit. I ask existing users of a product how they would feel if they could no longer use the product. In my experience, achieving product/market fit requires at least 40% of users saying they would be “very disappointed” without your product. 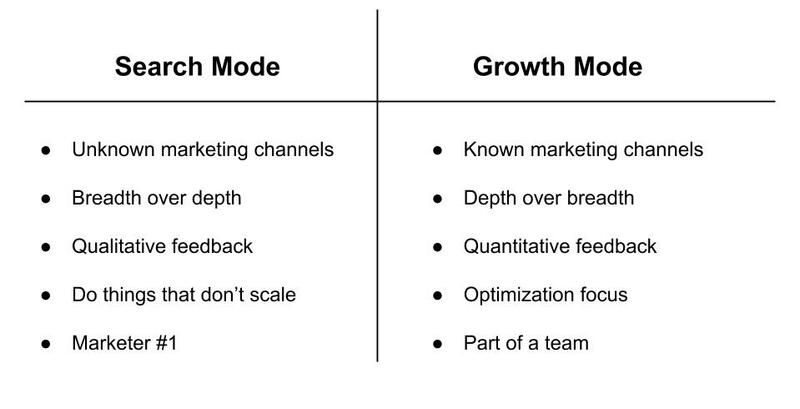 If there’s one takeaway from this article, it’s that if you are looking to hire a marketer for your startup (or join a startup as a employee) you need to find out if the company is in “search mode” or “growth mode.” I’ve created an ugly chart below to summarize what I’m going to discuss. In the rest of the article, I’m going to break down the different distinctions I’ve experienced as a marketer. Put simply, search mode is much more qualitative. I’ve spent a decent amount of my time at YesGraph reaching out to businesses who would be a good fit, learning more about what they love/hate about their job, and finding where they congregate online. I’m focusing on things that don’t scale, and working on getting the first paying customers onboard. It’s a blend of business development, sales, coding, and marketing. In search mode, the marketing channels are unknown. Should we focus on content marketing, paid acquisition, or press? My job is to find what works, and what doesn’t. As a marketer, you need a solid understanding of a variety of channels. If you’re an engineer, I’d compare it to being a full-stack developer. Resources are limited, so breadth is better than depth. In search mode, **data is important, yet listening to customers is where you will gain the richest insights. **That’s exactly why we run searchlight meetings with local companies. If I were to hire someone for this role, I’d focus on the candidate’s creativity, understanding of a variety of marketing channels, ability to collect feedback from potential customers, and how comfortable they are with ambiguity. Lastly, I personally would test if they are comfortable using the phone. For some unknown reason, many people in startups seem to fear this. I’ve found the best insight has come from phone conversations, but that’s just my opinion. At Boundless I had the opportunity to see a company go from search mode to growth mode. We launched the paid product this past fall, and the marketing of the product changed significantly. We learned that SEO and affiliates were big wins, and these channels were unknown only a few months before. Likewise, the marketing was much different. If you know that SEO drives sales in a cost effective way, what is the next step you take? In growth mode, the company is focused on optimization of known marketing channels, which means that changes are measured with A/B tests and other experiments. Your role as a marketer is much more quantitative too – which means spending quite a bit of time in Mixpanel/Kissmetrics and Google Analytics. Growth mode doesn’t mean you should stop running experiments in new marketing channels, but if a specific marketing channel is making money for your business, optimization should be a focus of your time. In growth mode, marketing roles are more specialized. Typically there’s a marketing team, with different employees working on different channels (one person works on PR, another on affiliates, etc.) This is also the right time to hire a VP of marketing to manage the team. If I were to hire someone in growth mode, I would focus on the depth of their knowledge of a specific marketing channel. I would also focus on their ability to create marketing experiments within a specific channel, and how they would measure results. If you’re a startup, hiring a marketer isn’t easy. I hope this post outlines specific traits of a marketer you should look for, and how you can find a good fit. As a marketer, you need to assess your skills and determine what role makes sense for you. If you have thoughts or feedback, I’d love to hear it.